A septic system is an onsite waste-water treatment system that processes and purifies household waste (effluent). Effluent consists of “black-water” (toilet waste) and “grey-water” (kitchen sink, bathtub and laundry waste). If your home is not connected to a public sewer line, you must use a septic system. Anytime you flush the toilet or run water down a drain in your house, it flows into a pipe that leads to your septic system. 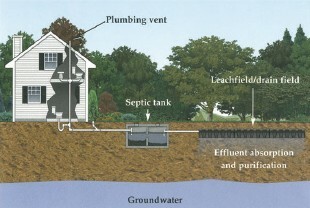 Solid waste sinks to the bottom of the septic tank, where it sits for 24 to 48 hours and gets broken down by bacteria. After the effluent is broken down, it empties, along with the liquid waste, into the drain field and is absorbed into the soil as fertilizer. 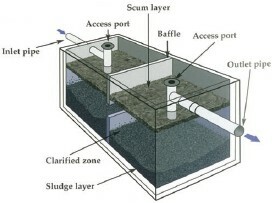 Greases, oils, and fats float to the top of the tank, where a scum layer is formed. This scum cannot be broken down and therefore must be pumped out of the tank every 1 to 3 years, depending on how fast it builds up. The HOOT Aerobic Treatment Septic System is a complete five-stage, one piece waste-water treatment system. This feature-packed aerobic treatment system operates like a small municipal treatment plant. Pretreatment tank where effluent enters. Chlorinator where the clear effluent passes through for disinfection. Holding tank for disinfected effluent ready for discharge. Extremely quiet, efficient aerator and pump. Unique solid-state HOOT Control Center monitors and controls the septic system. Visit http://www.hootsystems.com to learn more about HOOT Septic Systems. And if you have any questions about septic systems, feel free to give us a call at Southeastern Septic LLC in Lakeland, Florida. Southeastern Septic offers only top quality septic systems and solutions to customers in Lakeland, Auburndale, Zephyrhills, Mulberry, Bartow, Polk City, Winter Haven, Plant City, and Polk County.